You deserve the best while you’re traveling, and the right hotel could give your trip that extra little detail that makes all the difference. Having a spa on-site gives you a green light to relax and enjoy your time away from home, and may be just the thing to make your vacation feel more like a vacation. Get your R&R at one of these 10 best spa hotels in Mississippi. This charming boutique hotel and spa has everything going for it: yoga, facials, body services, therapeutic baths, and massage, all offered on-site without you having to leave the hotel. They also have cooking classes, meeting spaces, and other amenities to ensure your stay truly feels like a vacation. This homey inn will have you wanting to move right in. Situated in a historic home, it’s the most unique lodging of the city. Their on-site day spa is more like an oasis, offering services that promote both relaxation and holistic healing. Casino might come first in their name, but a trip to their spa is a must-do. Located right on the waterfront, this 32-story mega resort has a full-service spa and salon that will give you plenty of ways to spend your casino earnings. They offer treatments for singles and couples, as well as service packages to help you get more for your money. Backed by the Hard Rock brand, you know you’re in for a real treat. This spa never fails to disappoint with its variety of services, attention to detail, or quality of services. You can expect personalized treatment and superior experiences every time. This unique resort is every bit as beautiful as it is enjoyable. You’ll want to skip the casino and head straight for the spa when you arrive. In addition to their customized treatments, you can enjoy the steam room, sauna, hot tub, and outdoor pool included with your services. As the only day spa bed and breakfast around, you won’t need to go anywhere else. This place has everything you need for a day (or a few days) of R&R, including massage, spray tan, salon services, couples’ services, body treatments, and more. Being situated just a stone’s throw from the sandy beaches gives you all the more reason to book a stay here. The Westin is known across the world for its high-quality everything, and this one in Jackson doesn’t disappoint. They use a blend of carefully curated holistic products that make your treatments as good for you as they make you feel. This hotel, spa, and casino features low room rates, giving you the green light to indulge yourself in their on-site spa. Here you can leave the world behind as you succumb to some of the best pampering you’ll experience anywhere. Combine the spa with an on-site restaurant and no shortage of entertainment, and you may never have to leave the grounds until you’re checking out. This cozy yet sprawling resort gives you everything you need to unwind and let loose. You’ll want to prioritize a visit to the spa, where you’ll find a heated pool, gym, and a full list of services to make you a better version of yourself. You can’t help but feel like you’ve struck gold. You’ll feel like a new person after a visit to the Woodhouse Day Spa at Harlow’s Casino. They prime your mind and body for rejuvenation, offering massage, facials, manicures, pedicures, and more. 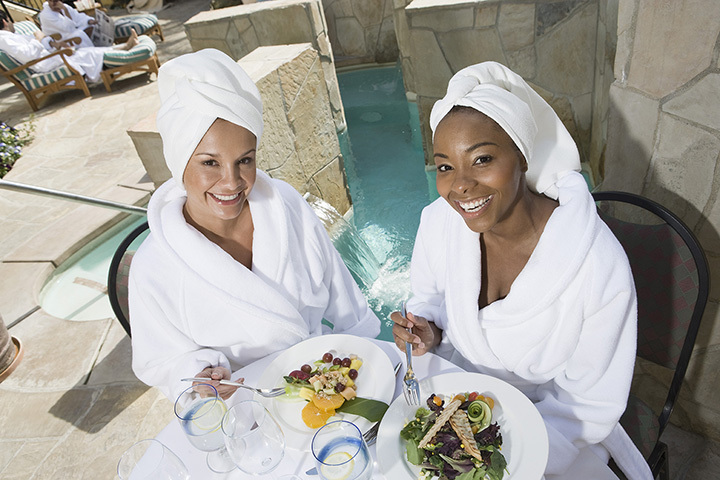 Go with your significant other, plan a girls’ day out, or simply enjoy a little “me” time.